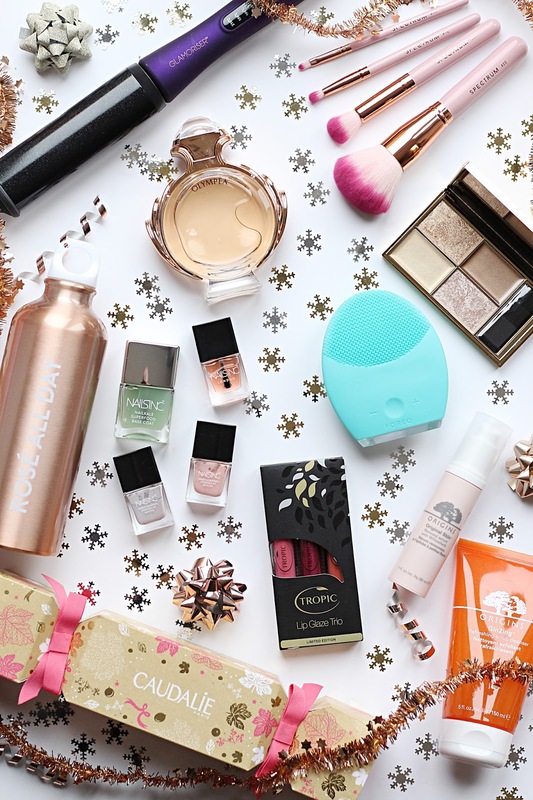 Today I thought I'd bring you another gift guide - this time focusing on gifts for anyone who's obsessed with all things beauty. Being a self-confessed beauty addict myself, I had a lot of fun putting this together. I think Christmas is the best time for anyone who loves beauty - with so many gift sets and limited edition product ranges to choose from, we're totally spoilt for choice. First up, Caudalie's stunning Vinosource Cracker*. Filled with a trio of moisturising goodies from the natural beauty brand, including a serum, moisturising sorbet and moisturising mask, it comes beautifully packaged and at £10 it won't break the bank either. Sticking with skincare sets, Origins always impress me with their fab selection. They have some incredible gift sets available, most of which offer amazing savings, and are sure to be a hit with any skincare fanatics out there. They've also released a ranged of candles this year which are definitely worth checking out. I've included the Ginzing Refreshing Scrub cleanser (the most energising, ready-for-the-day cleanser ever) and the Original Skin serum (leaves you with super soft, poreless-looking skin) in here as they both come in the Radiance Ready set, which I think is a total steal at £32. If it's a nail set you're looking for, the 'Rose All Day' gift set* from Nails Inc. is £25 and comes with a selection of their best-selling top and base coats, two pretty pastel shades and a seriously nice rose gold water bottle. I'm a big fan of Nails Inc.'s polishes and this set is ideal for anyone looking to kick-start their nail care routine for 2017, as two of the polishes are enriched with the antioxidant Matcha powder and one has the super food kale in it - perfect for healthy nails in the new year. A brand that has only fairly recently come under my radar is Tropic, a natural, animal-friendly beauty brand with both skincare and makeup products. Their Lip Glaze Trio* is limited edition and comes with three festively-named shades: mulled spice, candy pop and sugar plum. Tropic's lipglosses are award-winning, and I'm obsessed with the mulled spice shade. Ideal for any lip product lover! If you know your recipient is into beauty but aren't sure exactly what, I think a couple of fail-safes have got to be perfume and makeup brushes. Everyone loves a perfume (or, indeed, perfume gift set) at Christmas and if you know her scent of choice, it's a no-brainer to invest in it as you know she'll love it already. If a new fragrance is what you're after, however, at the minute I love Paco Rabanne's Olympea* - it comes in the most gorgeous rose gold bottle and is a really lovely mix of floral and vanilla. If brushes are more your bag, my all-time favourite brush brand has got to be Spectrum. Made with cruelty-free synthetic hair and available in some amazing collections (I'm talking marble, mermaids and so much more) it's a stand-out brand that is guaranteed to be a hit. The above are from the Bombshell set* and just look at how pretty they are. Aside from looking great, they're honestly amazing brushes too. If it's beauty gadgets you're after, top of the list has got to be the must-have Foreo Luna 2 facial cleansing brush*. I reviewed the diddy travel version, the Luna Play*, a while back and absolutely loved it, so I just knew I'd love this one too. Available for every skin type, it uses T-Sonic power to help buff away makeup, dirt and unclog pores. It claims to rid the skin of up to 99.5% dirt and oil, and honestly it leaves my skin feeling so soft and fresh. It also has an anti-ageing feature on the reverse side, which uses lower-frequency pulsations to help reduce fine lines and wrinkles - so you get the best of both worlds. At £169, it certainly isn't cheap, but it honestly achieves incredible results and if you are thinking of buying a big gift for someone who's serious about skincare, this is it. For hair stylers, another popular Christmas gift, I couldn't resist putting my new favourite styler in here - the Glamoriser Salon Results Wave Wand*. I've been using this for a few months now and absolutely love it - if you're looking for an affordable have curler that will give you gorgeous, glam loose waves, this is it. Its barrel is infused with Black Diamond Oil to add shine to your hair too - perfect for the party season! Finally, if you're looking for a last-minute gift that won't break the bank, I thoroughly recommend visiting your local Sleek makeup stand and having a peek at some of their incredible palettes. I'm obsessed with their highlighter palettes, and recently got my mitts on the Cleopatra's Kiss highlighting kit - it gives you the most incredible glow that is perfect for the party season, and is only a tenner. LOVE! I've added some more beauty gifts below - let me know what you've been buying any beauty-loving friends this Christmas!